Salafist groups launched the Coalition for the Defense of Sharia (Islamic law) on Wednesday. The coalition plans to participate in Friday’s protests to demand the inclusion of Sharia law as the main source of legislation in Egypt’s new constitution. “We are here to announce the beginning of our activities to uphold Islamic Sharia against the attack of secular and liberal forces trying to undermine the Constituent Assembly,” said Tarek El-Zomor, Al-Gamaa Islamiya leader and founder of its Building and Development Party. El-Zomor addressed the issue of the Egyptian constitution-drafting process by the Constituent Assembly. “Sharia is in danger; those against their demand are challenging any article in the constitution, which only gives way for the application of Sharia and not even requires its implementation,” he claimed. Others want to bind the constitution with international agreements that allow what God has prohibited, he said. “Activities defending Sharia must continue until a referendum on the constitution is held,” he continued. At the press conference, El-Zomor called on the Egyptian people to participate in Friday’s protests to reinstate the rule of Sharia. He asserted the law was removed by Western occupiers two centuries ago. Leftist and liberal groups have criticised the assembly arguing that it is dominated by Islamists. Political forces against the drafting process of the constitution fear a constitution not agreed upon by all members of the Constituent Assembly. Critics are also concerned the draft will pass by a popular referendum before a Constitutional Court ruling on whether the Constituent Assembly will be dissolved or allowed is issued. The Head of the Salafist Asala Party, Adel Abdel-Maqsoud, described anyone who is against the implementation of Sharia as an "apostate" and stressed that Article 2 of the constitution should state "Islamic Sharia is the source of legislation." The current draft and the previous 1971 constitution stated the “principles of Islamic Sharia” as the source of legislation. The usage of the term “principles” of Islamic Sharia law in the draft is seen by many conservative and ultra-Orthodox Islamists as being too vague, which could simply translate into universal values of justice and equality, thus ignoring Islamic rules specific to social life in Islamic countries. Many Islamists believe that "vagueness" in concepts leads to moving away from the Islamic doctrine. Abdel-Maqsoud and others speaking at the press conference, such as conservative Al-Azhar scholar, Yehia Ismail, and Al-Gamaa Islamiya leader, Assem Abdel-Maged, made it clear that Sharia (itself not its principles) should become the main source of legislation. Sheikh Hashem Islam, conservative Al-Azhar scholar and member of the Fatwas Committee (religious edicts) of Al-Azhar, stressed this point and released a religious edict at the conference. He said Article 2 should read as, “Islamic Sharia alone is the source of all legislation and all that conflicts it is invalid and corrupt.” The article should also stipulate that Sharia governs the constitution and laws, he added. Sheikh Islam is officially accused of inciting violence against anti-Muslim Brotherhood and anti-President Mohamed Morsi protesters in August. Abdel-Maged also condoned placing the phrase “not contrary to God’s law” in more articles of the draft constitution. Speakers at the conference insisted there was an obligation on the part of Muslims to participate in the protests on Friday; some saying it is a divine duty. “Participation on Friday is a duty and no Muslim should neglect taking part in this protest to support Sharia as the main source of legislation,” said Safwat Abdel-Ghani, member of the Gamaa Islamiya. The anticipated size of the demonstration is unclear, especially since the largest and most powerful Salafist party, Al-Nour Party, said they will not join the demonstration, and the largest political group in Egypt's post-Mubarak era, Muslim Brotherhood, has not made a formal decision to join yet. 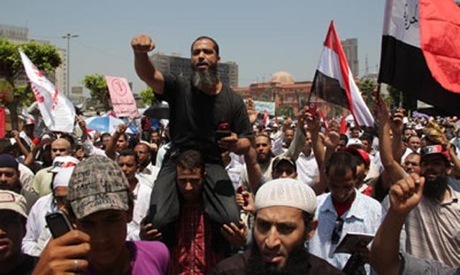 Also, Vice-chairman of the Salafist Nour Party Yosri Hammad stated earlier on Wednesday that his party will not partake in Friday's planned protest in Cairo's Tahrir Square. "More effort in educating Muslims about the principles of Sharia needs to be exerted so it can be a public demand," Hammad told Al-Ahram Arabic language news website. The parties and groups attending the conference included the Al-Gamaa Islamiya and its Building and Development Party, Salafist Front, Salafist Asala Party, the Independent Azharite conservative front, the Azhar Scholars Front, and Islamic Jihad affiliated with Peace and Development Party (under construction). Egypt from the beginning is a secular country, stop hijacking the truth with your lame excuses. Those radical Salafists and Muslim Brotherhood could only add about 3-4 million people out of 82 million Egyptians. They hijacked the revoluation but the secular people should not let this happen, they threaten with violence so Egypt falls into a civil war. This should never happen, both the army and the governement should put some measures to this and those who wishes to create violence, they should wake up the next day in jail, not see broad daylight untill they learn. Though I doubt they will ever learn.